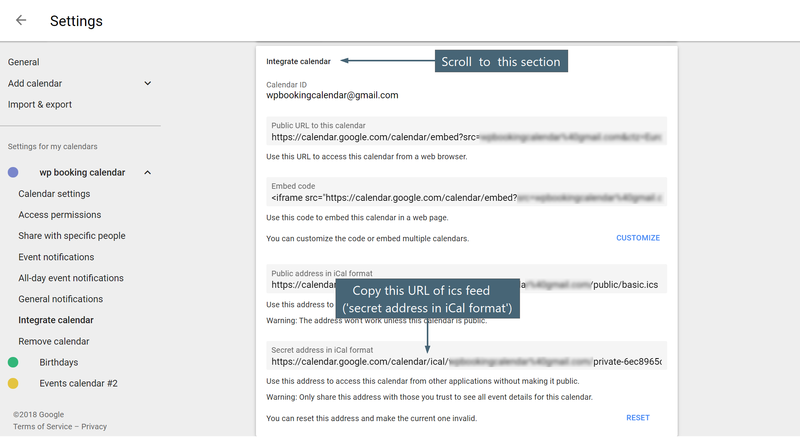 FAQ > Sync > How to start import of .ics feeds into Booking Calendar ? How to start import of .ics feeds into Booking Calendar ? 2) Requirements. Additionally for ability to import bookings from external websites, like Airbnb, Booking.com, HomeAway, TripAdvisor, VRBO, FlipKey and any other calendar that uses .ics format, you will be need to install Booking Manager plugin update 2.0 or newer ( https://wordpress.org/plugins/booking-manager/ ). 3) Getting URL of .ics feed. Now, when you have installed both plugins, you can start configuring of import events/bookings from external website. First of all you need to get URL of .ics feed, from where you want to import the events/bookings. 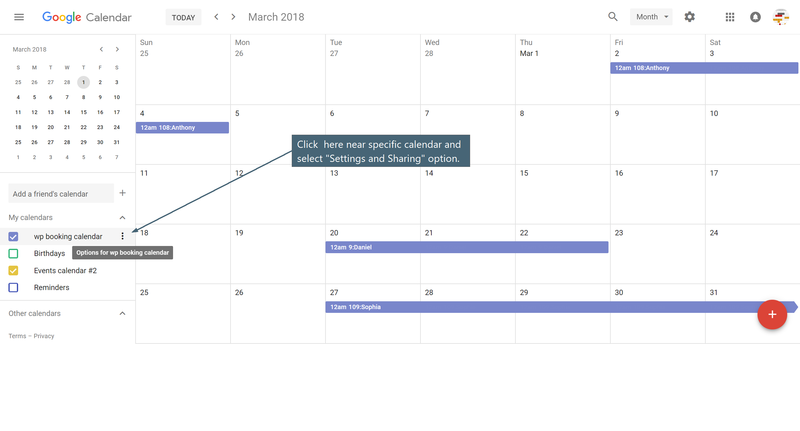 3.1) Open Google Calendar then mouse over specific calendar and click on settings icon at right side near specific calendar, then click on "Settings and Sharing" link. 3.2) Scroll to "Integrate calendar" section, and copy URL of "Secret address in iCal format"
4) Inserting Booking Manager import shortcode(s). 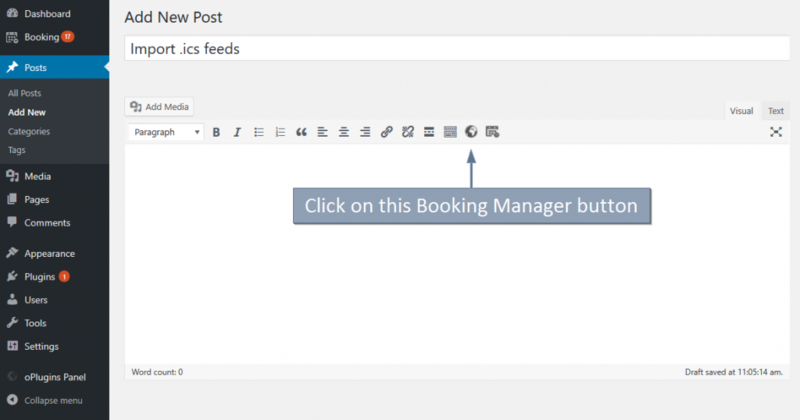 You will be need to insert the Booking Manager Shortcode for importing of events into some post or page. Then in popup dialog switch to the "Import .ics feed into WPBC" tab. Paste URL to your .ics feed in specific feed, and configure other parameters, like booking resource (in paid versions), where you want to import bookings, start and end date of import and other parameters. Please read more about manual configuration of Booking Manager import shortcode at this page. Please note, now, when someone will visit this page, the import process from this specific .ics feed will start into the booking resource, which you have specified in booking manager shortcode. 6) CRON. Its means that you need to visit such page periodically for start importing of bookings that can be created at other website. The best way its to configure CRON at your server for periodic access such page(s) and import of bookings from different sources. Please read more about CRON . Probably you will be need to contact your server administrator or support of hosting, if you will have some difficulties with configuring CRON at your server. Repeat steps 3 - 6 for different .ics feeds from different sources and for different booking resources (in paid versions of Booking Calendar). 7) TIP. As you can see from Booking Manager Shortcode, you can define in shortcode different URL to .ics feed and specific booking resource (in paid version). Using such shortcodes in different pages give a great flexibility to import from different .ics feeds (sources) into the same resource. Like one page for import from Airbnb and other page with different shortcode for importing from booking.com or Google Calendar. Also you can define different time interval in your CRON for accessing different pages and its means to start import of bookings with different intensity.